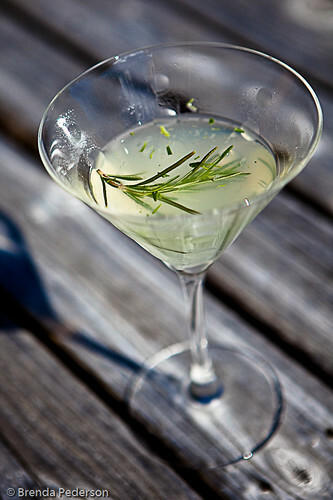 As promised, the recipe for the Tuscan Rosemary Lemon Drop that was so popular at my recent cocktail party. Please note, as I forgot to, that the rosemary sugar needs to be prepared a few days in advance. All recipes adapted from Kathy Casey’s Sips & Apps. Mix together then spread on a rimmed baking sheet. Set in a warm place for about 4 days or until rosemary is dried. Process in a food processor until finely ground. Can store in a tightly sealed container for one month. Make simple syrup by bringing the sugar and water to a boil. Stir to ensure the sugar is completely dissolved into the water. Remove from heat and cool. When cooled measure the amount of syrup. It should be about 1½ cups. Squeeze the same amount of fresh lemon juice. Mix the lemon juice with the syrup and store in the refrigerator. Place some of the rosemary sugar in a flat, rimmed plate, slightly larger than your cocktail glasses. A small pie plate may work. If desired, run a lemon around rim of glass and dip in the rosemary sugar. Shake vigorously, and then strain into glass. Garnish with a fresh sprig of rosemary, if desired.